That’s the nautical address for a wonderful treasure that so many have discovered through the years – Holden Beach! And it’s certainly being recognized as a treasure here in Brunswick County, North Carolina, as we celebrate its 50th birthday along with the Town of Holden Beach on February 14, 2019. Brunswick County, located in the southeastern coastal stretch of the state, was formed in 1764 from the neighboring counties of New Hanover and Bladen, and was named after King George I, the Duke of Brunswick and Lunenburg. Early inhabitants of Brunswick County included the Cape Fear Indians, and English and French Huguenot settlers. 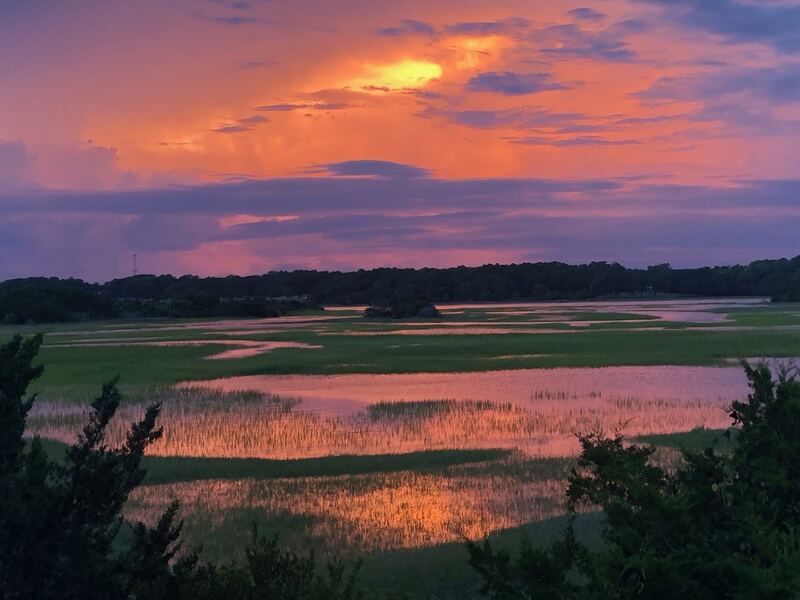 Holden Beach is perched on the Atlantic Ocean in the southern tip of the county, bounded by Shallotte Inlet to the west, Lockwood’s Folly Inlet to the east, and the Intracoastal Waterway to the north. It’s known for its lovely beaches, rich coastal heritage, friendly locals, and as being one of the “Top 10 Family Beaches” in the nation. The island boasts a long family history of developing and serving in the community and a concerted effort to preserve the quieter, family-friendly culture. Throughout its history, protection of the dunes and natural areas for endangered wildlife has been a priority as well, and today the town’s thriving Turtle Watch program is supported by an active team of volunteers and educators. And, since it’s conveniently located between the entertainment of Myrtle Beach, SC and historical Wilmington, NC, Holden Beach can focus on being the perfect pocket of the quieter, relaxed, eco-friendly living that it is. Holden’s Beach, as some of the locals still say, is one of the three South Brunswick Islands that are man-made south-facing barrier islands formed when the North Carolina section of the Intracoastal Waterway (ICW) was constructed between 1930 and 1940. The eight-mile long Holden Beach is the largest, with minimal commercial development. It also has the longest family history, starting with Benjamin Holden’s pre-American Revolution land grant acquisition in 1756 from King George II. Following Holden’s death 10 years later, the land was divided among his three sons, with the land eventually being inherited by grandson William Holden, followed by his namesake, who divided the property among his six surviving children. They, along with their offspring, have played various roles in the expansion and development of the island and mainland through the years. Three Civil War blockade-runners sank off the coast in Lockwood’s Folly Inlet. Blockade Runners Elizabeth (lost in 1863), Bendigo (lost a few months later when it mistook Elizabeth for a Union blockader and attempted to pass inshore), and Ranger (which was beached one mile west of the Lockwood’s Folly Inlet and destroyed by fire in 1864) are all owned by the State of North Carolina and listed in the National Register as part of an archeological district. The USS Iron Age was also grounded in 1864. A commercial fishery was started on the island by John Holden, Jr., a 4th-generation land owner, and in 1924 he surveyed a plat which he called Holden Beach Resort that represented the first subdivision of beach property in Brunswick County. From 1923 to 1926 Mr. Holden built a 1.5-mile road from the family homeplace to the coast that included a bridge and a causeway, and then completed the 10-bedroom hotel project with a kitchen and dining room which was run by his family. The Holden Beach Bridge was built in 1925, and after its destruction by the ICW construction, negotiations with the State of North Carolina resulted in the operation of a public ferry to reach the island in 1934. 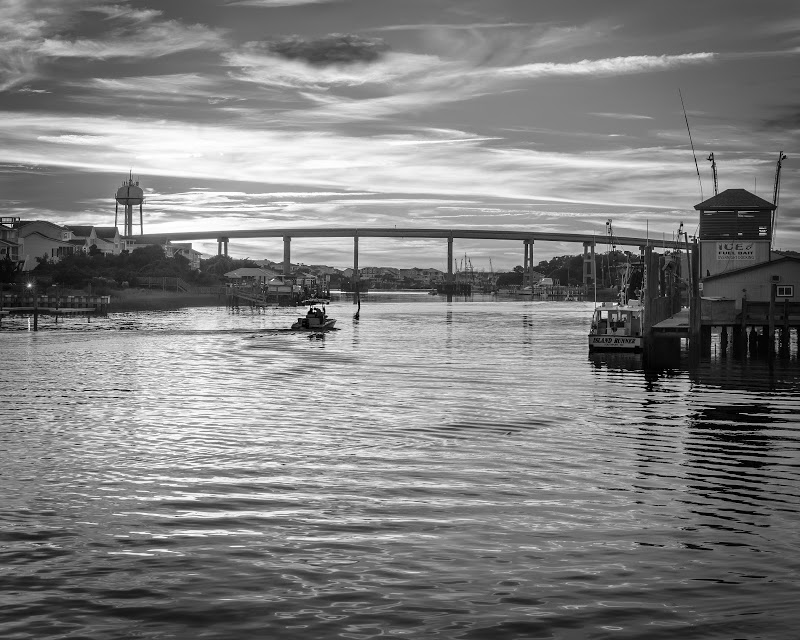 The history of the Holden Beach bridge really starts with the island’s first wooden ferry, which began operation in 1934 through the early 1940s, and was pulled across the waterway by hand. The ferry operators used a notched hickory jack stick to catch hold of the cable and pull the ferry across. When possible with the tides and winds, it operated 24 hours a day every day. On Feb. 20, 1954 the first ferry ceased operation when it was replaced with a turn bridge. In looking back at island history, it’s hard to ignore a strong “lady” named Hazel. The hurricane took a devastating blow on the island in October 1954 and a majority of the 300 homes were destroyed because the storm hit at the worst time – the year’s highest lunar tide, nicknamed the “marsh hen tide” by local hunters. The good news is the storm opened another inlet in almost the same spot as the former Mary’s Inlet where many of the local fishermen fished. A few years later, it was filled in again and the Holden Beach Pier was constructed there, a 1,420-foot pier built by Odell Williamson. Lonnie Small moved to the area and fulfilled his dream by developing the Holden Beach Pier and Campground. The pier was rebuilt in 1989 after being damaged by Hurricane Hugo. Then after Hurricane Floyd in 1999, the pier was rebuilt to its current length of 750 feet. Seafood is, of course, a significant part of Holden Beach history. During the late 1960s, as part of marine life preservation programs managed by the N.C. Division of Marine Fisheries, Holden’s Beach had the only river lease and was allowed to move clams to the six-mile lease for the following season when they were raked up and sold to fish markets. Fish houses have popped up through the years, named after families like the Fulfords, the Holdens, and the Robinsons, and they served as much as social and community gathering spots as businesses taking in and preparing seafood to sell. Historical pictures document mullet sheds where fishermen would sell their fish, which were cleaned and then washed in the ocean in large baskets made with strips of white oak. Salt was used to preserve the fish before being packed for shipping. In addition to the pier, Theadey’s Place was a popular hangout for the young folks in the 1960s, where they grabbed snacks, soft drinks, fishing outings, and even water ski lessons on the fly. As the island began to develop more with housing and businesses, on February 14, 1969, the island was official incorporated as Holden Beach. Worship occurred in the old pavilion which was destroyed by Hazel, so locals began gathering in homes for Bible study, and eventually, fund-raising began for the construction of the Holden Beach Chapel, where the first worship service was held in 1961. It was later expanded in 2003. Family-owned Hobbs Realty appeared on the scene by 1977 as it began building beach cottages and making its mark as a premier rental management company on the island. The Hobbs have been steadfast in their commitment to honor the past, present, and future in their third-generation family legacy and business. On May 13, 1986, the Town of Holden Beach dedicated a new high-rise steel and concrete bridge, allowing better access to the then more than 1,900 homes on the island. Driving across the bridge provides undeniably breathtaking views of the ICW, the Atlantic, and the island. And thousands flock to Holden Beach for the annual Festival by the Sea the last weekend in October for the opportunity to walk across the bridge the one day each year when it’s closed to traffic. Talk about spectacular photo ops! Although the population has grown from 136 in 1970 to 644 by 2016 according to the U.S. Census — and has become an increasingly popular destination for vacationers and part-timers — Hobbs Realty proudly celebrates Holden Beach's many years of a small-town feel with views that can’t be beat! Happy birthday, Holden Beach! We are so blessed to live, work, and play here in our little slice of heaven by the sea.